One of the natural gifts of living in south Texas is the diverse landscapes. As the coastal plains meet the rolling hills and the craggy bluffs, a sort of magic seems to settle over the Hill Country (especially during sunset!). When folks decide to make the move out to the Hill Country, one of the hottest real estate commodities is a gorgeous yard. With sweeping views and high acreage, these yards prove that a Hill Country home is far more than just brick-and-mortar. This beautiful Spanish home sits on three acres in Bulverde (between Spring Branch and San Antonio). Its perch on top of a hill provides a rich view above the canopy and into the lower elevation land beyond the lot. Cozy up outside on the stunning porch, relax in the hot tub, or have friends over for a meal! The kitchen inside has double gas ovens, two main-level bedrooms, two sub-level bedrooms, and an additional living room and wet bar...not to mention the detached office/hobby room, basketball court, and large windows that cater to the view. Located in the charming community of Helotes, TX (just beyond the far Western reaches of San Antonio), this home on Walnut Canyon is perched just north of the Government Canyon State Natural Area. The property sits on a hilltop that provides a gorgeous view of this premiere landscape. If you are someone looking for a secluded spot to call yours, this house sits on 5-acres and barely has a neighbor within earshot. Three outside decks allow you to enjoy different vantage points of the natural area around the property, and a brick walkway wraps around the house with occasional garden features, a storage shed, two-car garage, and more. A local favorite, this imagination-stirring property features a breathtaking ground-level view of the trees and wildlife. This gorgeous house on Cibolo Drive in Bulverde is a two-story, four bedroom, three-and-a-half bathroom design sitting on two acres in the hills of Rim Rock Ranch. There are three (yes, three!) living areas and a gigantic master bedroom with high ceilings and a fireplace that feels like a vacation home itself. The outside has a comfortable wrap-around deck that looks out at oak trees and deer that will come grazing my the house. This is a great home for families with younger kids who want to get lost on the property while they explore in their own backyard. As you can see, 31056 Tres Lomas is the essence of luxury for any purist of the Texas Hill Country spirit. Sitting on nearly twelve acres, this home in the Rim Rock Ranch neighborhood has a view of the hills below that will remind you of a movie. Have late night parties with friends to watch meteor showers or just take in the starry night sky without the issue of city light pollution. The house itself has windows that fill every wall, granting access to that perfect natural light, giving each room an authentic look and feel. There is a private gate entrance, three bedrooms, three bathrooms, a three-car garage, and a detached two-car garage with an apartment. Looking for a house on the water? This stunning home in the Oak Shores Estates neighborhood in Canyon Lake is what you have been looking for. In a premier gated subdivision, this house sits on two acres and features a backyard that rolls into the blue waters of Canyon Lake...with a boat ramp nearby! The kitchen has granite countertops with lovely wooden cabinets, as well as common rooms with large windows to keep the view of the water in sight. The living room and master bedroom both have deck access to two separate decks, one for privacy and the other to entertain guests. This historic and luxurious home is located in the Landons Crossing neighborhood in Blanco and features views from one of the highest points in Blanco Country (overlooking the river and Vaaler Creek golf course!) This gorgeous ranch homestead sits on ten acres with plenty of space to do all sorts of projects in the yard. The home has many large windows to accent the area it is in and let that natural light into the rooms. The living room is large with a rock fireplace, as well as additional fireplaces in the sun room and master bedroom. There are maid’s quarters that can obviously be used to host the in-laws (don’t tell them we said that) and a stone path leading outside. 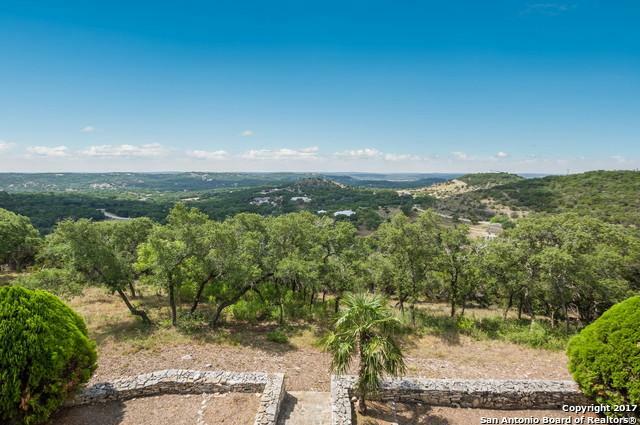 As George Strait likes to say, “The stars at night/are big and bright/deep in the heart of Texas!” Thankfully, these gorgeous, spacious properties let you enjoy the Hill Country to its fullest and most beautiful potential.